A small talk with her and you would surely be mesmerized by her vigor and enigma. She has several honors and awards to her name, which clearly shows her perseverance and determination to make a name for her. She has a Masters in Marketing from Queen Mary, University of London. She started her career as an imaginative, hardworking and pliable fresher looking forward to making a career in the field of Marketing and Advertising. After working at several important positions across different companies, she planned to use that experience to start her own venture. Tripeeza is e-commerce travel website that aims to make travel easy for the users. She wants to greatly contribute to the travel industry and inspire people to travel everywhere with ease. 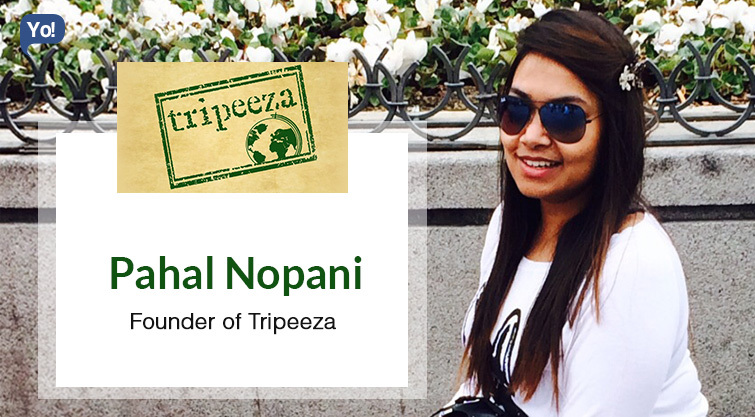 Tripeeza is basically an e-commerce travel website that aims to make travel really easy for the audiences. It will give the audience at large an opportunity to experience what it feels like to travel like a pro. It would also greatly contribute to the travel industry and inspire people to travel far and wide with ease. How that would be possible and what it would feel like to experience, that is something that the users need to wait for until the final website launch. Currently we have a landing page where interested users can leave their email address. We would intimate them on the final website launch and some lucky ones would also be in for a surprise. My passion for travelling and exploring new places. I believe that the world is a beautiful place and everyone should get the opportunity to travel far and wide with ease. St Augustine once said, ‘The world is a book and those who do not travel read only one page.’ Thus, there was a need to build something to bridge that gap, to provide people with different alternatives and opportunities to be able to travel far and wide. “If you do what you love, you’ll never work a day in your life.” – Marc Anthony. Pursue your passion because that’s what’s going to keep you going. That’s what going to make you happy and satisfied within. Don’t be what others want you to be. Have the courage to be what you want to be! Every bit has been challenging. I learn new things everyday. But how to overcome those challenges with the most innovative and optimum solutions is quite challenging. However, considering the most challenging part, I believe taking the first leap has been the most difficult and challenging bit of the entire journey. That’s because, it is based on sheer belief that this is going to work and I am ready to take the plunge. When you create something that is unique, you are also afraid about its acceptability with the users. It therefore requires a lot of self confidence and gut. Once I overcame that, I gradually learnt how to deal with other challenges and now I happen to enjoy them. By believing that I could do it. It takes a lot of patience and composure but that’s what entrepreneurship teaches you. It’s a school in itself where you tend to learn new lessons every single day. The challenges you face, make you grow and there is a sense of accomplishment each time you overcome them. We’re currently bootstrapped. Currently we are more concerned with the final website launch and getting our product right! We have a very relaxed workspace culture giving people the freedom to work to the best of their abilities. Mutual trust on each others strength and respect along with the love for the work we do is something that’s common to all of us. Moreover, working together, by sharing ideas and feedback, having an open door policy to vent out grievances or provide suggestions really helps us understand each other better. We believe in the power of people and that’s what keeps us going. After all teamwork makes dream work! The habit of noting down things. In the end the only person who’ll be by your side is You! So be your own hero. Mobile application New features More global coverage. I have a whole bucket list! “She believed she could, so she did”!